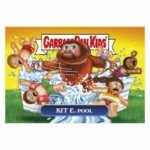 Wednesday marked the last day Topps will offer daily GPK cards. 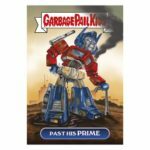 Today Topps revealed the print run for Garbage Pail Kids Network Spews #91. The final Network Spews card featuring a trio of superheroes ended up doing really well with collectors finishing with 185 in sales. Topps focus the last couple of weeks was on Wacky Packages cards. What artists showed however was collectors were willing to pay for classic gags, featuring established properties, and well done art. This marks the end of a controversial time in the history of Garbage Pail Kids. With the daily sets now complete it remains to be seeen how topps will incorporate their online offers going forward. Yesterday artists begin receiving word from Topps that they will no longer be producing daily Garbage Pail Kids and Wacky Packages cards. Wednesday’s cards served as the final daily offerings from Topps for the foreseeable future. Instead, Topps will focus on smaller weekly online sets. The daily cards were based off Topps’ popular Topps Now Baseball Card program started in early 2016. While Topps had been selling smaller GPK sets online, their first daily cards appeared in the GPK Disg-Race to the While house set that took aim at the presidential election. More daily sets were launched by Topps including two Trumpocracy sets, GPK Network Spews, Wacky Packages Alternate Facts, and the Twister set. There was no overarching reason supplied to the artists on why the daily cards were ending. A number of reasons could certainly be in play. Sales have fallen constantly since the first release of the cards. Collectors have complained about too much political focus, over saturation of the market, along with artwork from certain artists that seems rushed. With sales falling often below 100, it may no longer have made sense financially to offer daily cards. The focus will now turn to weekly smaller online sets, similar to ones offered in the past. Past sets focused on the holidays, awards shows, TV, and musicians. While sets might not appear every week, you can expect similar themes. More than likely sets will continue to see GPKs mixed with Wacky Packages. With limited political cards, less cards offered, and possibly more time for artists to complete cards, it will be interesting to see if sales start to rise. After coming out strong for Transformers, collectors stayed away when it comes to gorillas. 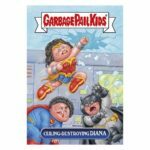 Today Topps revealed the print run for Garbage Pail Kids Network Spews #87. The card was the only GPK released on Tuesday. Topps has brought the focus back to Wacky Packages the last couple of weeks. Artist Michael Barnard’s parody of a recent viral video of an gorilla playing in a kiddie pool just didn’t resonate with collectors finishing fell under 100 copies sold. The Wacky Packages sold that sam day also finished low in sales. It will be interesting to see if the low sales trend continues as the week marches on. Here is how the lone card from Tuesday finished. For the second day in a row there is just one online GPK card offered by Topps. Today Topps launched Garbage Pail Kids Network Spews card #91. Today’s card by artist Layton DeJarnette features a trio of superheroes. Topps is also offering 3 Network Spews Wacky Packages. Today’s card can be purchased for $9.99 or in lots of 5 for $29.99, 10 for $49.99, or 20 for $79.99. There is a 4 card bundle featuring one of each card for $29.99. Shipping is free in the US with he SmartPost option, while international shipping is $10. The cards are available for 24 hours on topps.com. Topps will reveal the print run at the end of the sale. Topps is starting this week out slowly for GPK collectors with only one card. 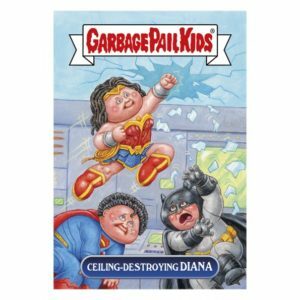 Today Topps launched Garbage Pail Kids Network Spews #87. Today’s card, done by artist Michael Barnard, is a parody off the recent viral video of a gorilla playing in a kiddie pool. Topps is also offering one Trumpocracy and three Network Spews Wacky Packages cards. Each of today’s cards can be purchased for $9.99, or in lots of 5 for $29.99, 10 for $49.99, or 20 for $79.99. A five card bundle featuring one of each card is available for $34.99. Free shipping in the US is available via the SmartPost option, while international shipping is $10. The cards will be on sale on Topps.com for 24 hours. Topps will reveal the print run at the end of the sale. After waiting the weekend, Topps wrapped up the prints runs from last week cards. Today Topps revealed the print run for Garbage Pail Kids Trumpocracy 2017 #36, and GPK Network Spews #85. Collectors came out in full force for the Transformers. Michael Barnard’s parody of the upcoming Transformers movie saw sales spike finishing with 268 copies sold. The Trumpocracy card however remained in the low 100’s. Collectors are showing they will come out for popular gags and good artwork, but are tired of the political cards. After another abbreviated week last week, it will be interesting to see what Topps has to offer this week. Here are how the final numbers came out for Thursday’s cards. For the second day this week Topps is back with their daily online exclusives. 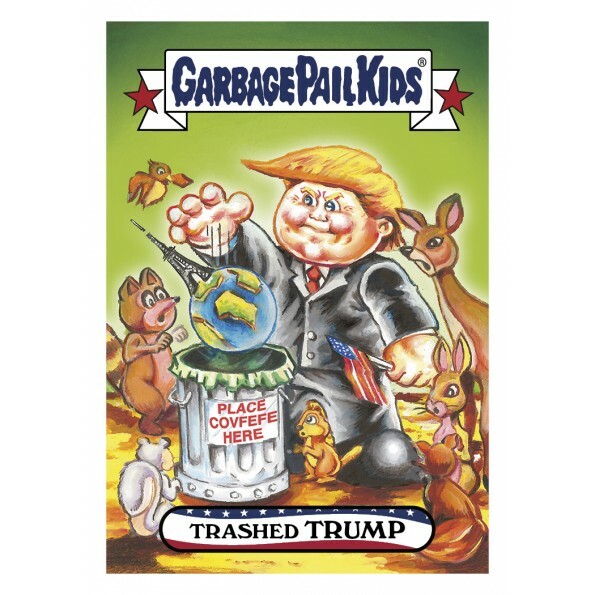 Today Topps launched Garbage Pail Kids Trumpocracy 2017 #36 (Artist: Barnard), and GPK Network Spews #85 (Artist: Barnard). Today’s highlight is a Transformers based parody done by artist Michael Barnard. Topps is also offering one Trumpocracy and one Network News Wacky Packages card today. Each of today’s cards can be purchased for $9.99 or in lots of 5 for $29.99, 10 for $49.99, or 20 for $79.99. A four card bundle featuring one of each card is available for $29.99. Free shipping in the US is available via the SmartPost option, while international shipping is $10. The cards are available for 24 hours on topps.com. Topps will reveal the print run at the end of the sale. Here are the pictures of today’s cards. Topps decided last week to change things up. There was only one day of Trumpocracy/Network Spews cards, and of that only one GPK card was offered. Topps also decided to return to offering the larger online sets, with a set completely based on former FBI director Comey. 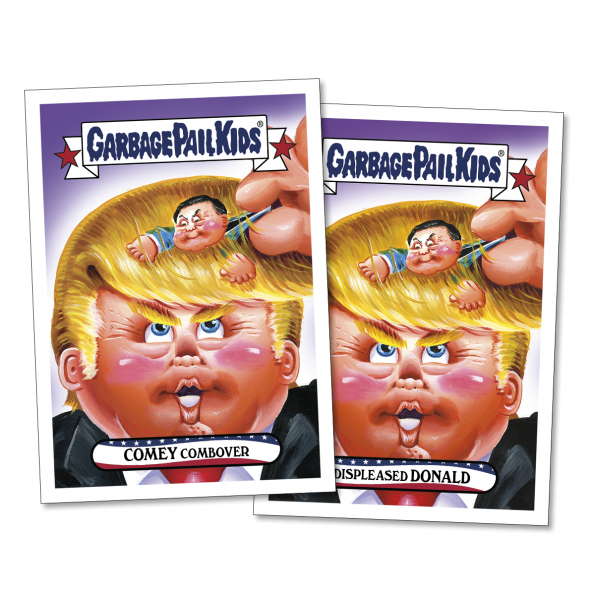 After a delay, Topps today finally announced the print run for Garbage Pail Kids A Comedy of Comey online set, and Network Spews card #80. All the GPK cards finished right around the same amounts, in the low 100’s. That is right around where cards have been selling lately. It looks like Topps may be de-empathizing the daily cards. Here are how the final numbers for last week’s cards came out. Moving back to the daily online offers, Topps has one new GPK card today. 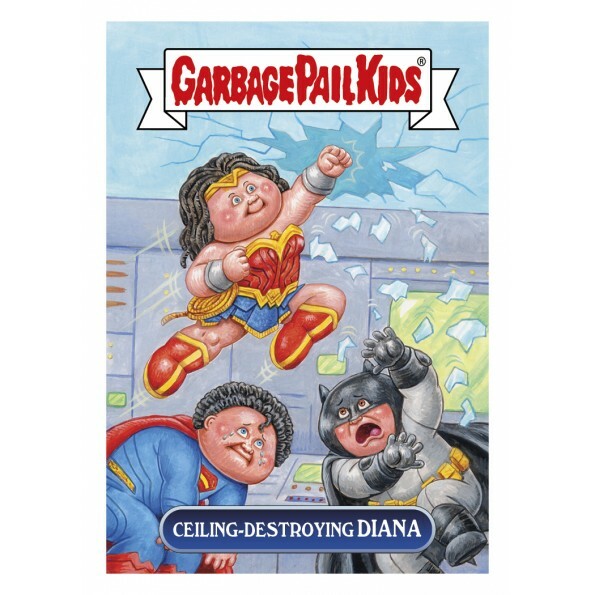 Today Topps launched Garbage Pail Kids Network Spews card #80. Today’s card, by artist David Gross, is a parody of Jerry Seinfeld refusing to hug. Topps is also offering one Trumpocracy and two Network Spews Wacky Packages cards today. Today’s card can be purchased for $9.99 or in lots of 5 for $29.99, 10 for $49.99, or 20 for $79.99. A four card bundle featuring one of each card is available for $29.99. Shipping in the US is free with the SmartPost option, while international shipping is $10. The card will be available for 24 hours on topps.com. Topps will reveal the print run at the end of the sale. Here is the picture of today’s card. After an abbreviated week of online offers, Topps waited until the end of the week to reveal print run information. 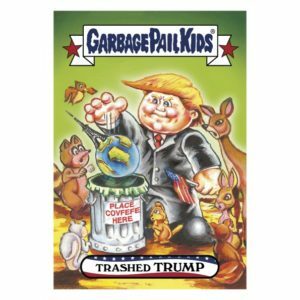 Today Tops revealed the print run for Garbage Pail Kids Trumpocracy 2017 #30, and GPK Network Spews #75/#77. Results for the sales were mixed. One GPK finished in double digits, while two others sold in the mid 100’s. Leading the way was the return of artist Jeff Zapata, whose Trumpocracy sold 160 copies. One interesting note it appears Wacky Packages collectors are returning to purchasing the online cards. The last couple of weeks Topps has released more Wacky’s than GPKs, and sales are much higher for the Wacky’s recently. It remains to be seen of those trends will continue. 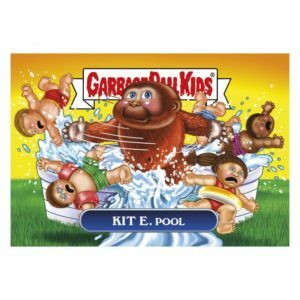 Here is how the GPK cards from this week week ended in sales.